We’re very proud to announce our public release of live trading with Interactive Brokers! Now you can seamlessly design and trade your algorithm within QuantConnect. Automated live trading is one of the most challenging engineering problems in financial technology. It involves controlling large financial resources, while pushing computational power to its limits! 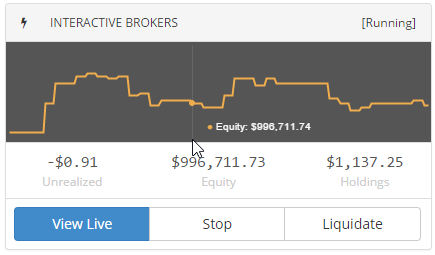 Starting today, you can deploy your algorithms to your Interactive Brokers accounts, using minute, second or tick resolution data for Equities and FOREX. All powered by our open source algorithmic trading platform, LEAN. QuantConnect live trading comes packed with some impressive functionality to help your trading! Using QuantConnect you can connect your algorithm to external data sources and stream updates to your algorithm events. Check out our demo using a Bitcoin REST API. With runtime statistics you can display custom information in the header of your live GUI to track your key indicators and asset values. Control your algorithm on the road with our mobile friendly, HTML5 GUI. You can see full running algorithm charts and trades, or just a summary of your algorithm performance. Its been an awesome month for the open-source project with contributions from people all around the world. We love working with the community and seeing LEAN used in ways we can barely imagine! Additionally thanks to @ammachado, and @dpallone for documentation fixes, and @willniu for working out our consolidator logic 🙂 The LEAN Engine is growing more powerful by the week. We’ve been experiencing some incredible growth and have bold plans for the next 12 months! We are opening an investment round and talking to investors to continue our growth plan.